It’s safe to say that no sane business owner would intentionally hire someone with homicidal tendencies. Nevertheless according to the National Health and Safety Administration, homicide is the fourth-leading cause of fatal occupational injuries. Here are three suggestions to help keep your workplace safe while while complying with federal employment laws. 1. 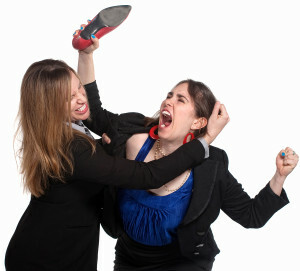 Maintain a zero tolerance workplace violence policy. Create a written violence prevention and personal safety training program, and incorporate it into your employee handbook. Be certain that your supervisors investigate acts or threats of violence and harassment, and take action quickly when an employee threatens violence, regardless of whether anyone else takes the threat seriously. Because an ounce of prevention is worth a pound of cure, suspend the employee (with pay) while you investigate to avoid a claim of adverse action. 2. Enforce your zero tolerance policy in a consistent manner. Workplace safety is a legitimate business reason for terminating an employee who poses a direct threat to health or safety. Under federal law, a threat of violence is a legitimate, non-discriminatory reason for firing an employee, and employees who threaten violence cannot insulate themselves because they are members of a protected class or have engaged in protected activity. Employees who are mentally ill and dangerous to co-workers, customers, or the general public are also not protected by the Americans with Disabilities Act (ADA). To determine whether someone poses a significant risk of violence, an employer must undertake an individualized assessment of an employee’s present ability to safely perform essential job functions. A conclusion that a person poses a direct threat should be based on a reasonable medical judgment that relies on the most current medical knowledge and/or on the best available objective evidence. The risk’s duration, the nature and severity of the potential harm, the likelihood that the potential harm will occur, and the imminence of the potential harm should all be considered under applicable regulations. OSHA has issued voluntary guidelines and recommendations for employers seeking to reduce the risk of workplace violence, but has not promulgated any mandatory standards. Although the guidelines are aimed at health care workers, they include many practical suggestions, including training, investigations, and checklists of workplace safety features, that are applicable to all industries. Finally, consider retaining an attorney to assist you in drafting, reviewing, and implementing a workplace safety policy that incorporates a compliant response to threats of violence in your workplace.